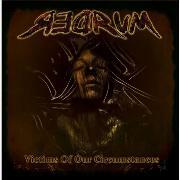 REDRUM as a band is based in Thessaloniki, Greece. The project was founded by Athan “Lyssa” Kazakis, guitars, and Panos Baxevanis, guitars, in late 2003. A year later they had 13 songs but no more members, so they opted for vocalist Michael Bormann (ex. BONFIRE, JADED HEART etc.). Michael joined in and they secured a contract with Sleaszy Rider for the release of “No Turning Back” in 2007. A lot of gigs and festivals followed and they shared stages with the likes of ADLERS APETITE, BONFIRE, EUROPE, and ROBERT PLANT. This album has been recorded in Germany, with Michael at the knobs, and the band feels set for news victories. The sound is as can be expected clear and crisp. The melodic style, the musicianship and their retro feeling for arrangements pay off. It might seem strange but I strongly reject the slow build “One of Us” as an opening track, and I wish they´d scrap the ending of JOHN FARNHAM´s “You´re the Voice”. Between those letdowns are nine distinctive melodic rockers in the vein of BON JOVI in their better days, and one that is an example of their somewhat less inspired latter years. The vocals feel impeccable, the arrangements are suited and not overworked, all to keep focus of the heedless melodies of 25 years back. I can´t really pick a truly outstanding track, but apart from track one and track twelve there are no fillers, only great melodic rock with fine riffs, really cool style and refrains to like for years to come. If they did fine in 2007, this will not do them less.